Bacteria Boy® began life as a single bacteria cell that evolved over time into his current slimy green blob. He isn't the slightest bit interested in maintaining good dental health. He grew up on the other side of Mount Molar in an area known as, The Badlands. For those who do not know, The Badlands are known for its abundance of candy cane fields and the endless Sea of Soda. No matter how hard Bacteria Boy® tried to resist the temptation, his sweet tooth and gluttony got the better of him. Although he knows the negative effects of sugar, he just can't quit eating it, even the cavities don't stop him. Unfortunately, Bacteria Boy® doesn't keep his love for sweets to himself. He enjoys sharing his bad habit by introducing the sugar rush to others. In fact, his mission is to infect as many Deciduous Dudes®, Bicuspid Babes®, and healthy molars of Molar Towne as possible, turning them into Zombie Teeth®! Despite his zombie-making ways, Bacteria Boy® isn't such a bully or rotten egg. He's more like a big softy with big-time candy cravings, and because of his cavity-causing ways, he is infamous for being Mighty Molar's® arch enemy. Bacteria Boy® has always been a little envious of the dental health superhero and his sparkling white smile. 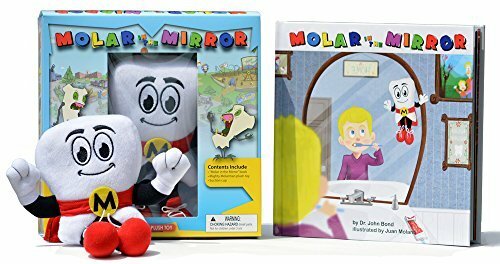 Just the shimmer of Mighty Molar's® enamel makes him cringe! If only he could say no to sugar, and have an interest in brushing and flossing, his green might just go away. When he isn't giving Mighty Molar® a hard time, Bacteria Boy® likes to chill at the Molar Malt Shop, where he often consumes the entire menu of ice cream, sodas, and sugary sweets!